Congratulations, Sentinels fans! Thank you all for being a part of this, our most succesful pre-funding campaign! The final tally comes in at 4481 copies of Wrath of the Cosmos preordered - that's amazing! Over the next few weeks, you can absolutely look forward to updates about the characters and stories of the Wrath of the Cosmos expansion. There is a lot going on in the Multiverse, and we are eager to share it with you! Read more about It's Over! Last day of the Preorder! Hello, everyone! It's the last day of the preorder campaign for Wrath of the Cosmos! Between Gen Con and PAX, we're been crazy swamped over here, but never fear! We will continue to post updates about all of the various bits of the Cosmos. Read more about Last day of the Preorder! We just got back from Gen Con and boy is our EVERYTHING tired! We're all thoroughly exhausted, but we're rallying, getting caught up, and preparing for PAX Prime next week! Yikes! Read more about Another promo?! Greetings, Preorderers of the Cosmos! On Friday, we passed the 1500 mark! Impressive! However, that was around the same time that a cargo container full of Sentinel Tactics arrived at our warehouse, and we've been busy packing boxes since then! All of those boxes shipped out today, and now we're on our way to Gen Con! BUT FIRST! Since you've waited so patiently, here is the hero you've been waiting for. Maybe. Wrath of the Cosmos Hero: Captain Cosmic! It's Thursday! Time to actually get into the contents of the Wrath of the Cosmos expansion! Read more about Wrath of the Cosmos Hero: Captain Cosmic! Over 1000 copies preordered! Introducing: Wager Master! Sentinels fans are the best fans! We have been blown away by your reactions to our preorder campaign. Over a thousand copies of the Wrath of the Cosmos expansion preordered in under a day and a half?! That's ridiculous. So is this villain. Before time was time, before space was space, there was the wager. The wager that nothing would happen. That wager was lost. And from that loss came the Wager Master. Read more about Over 1000 copies preordered! Introducing: Wager Master! Well over 500 copies preordered! Wow! We blew through the 500 copies last night, and we're still going strong! As a result of this progress, every preordered copy of Wrath of the Cosmos will also include the mini-expansion environment: Omnitron-IV! Read more about Well over 500 copies preordered! Over 100 Copies Preordered! Promo Cards Unlocked! Congrats, Wrath of the Cosmos preorderers! There are already over 200 copies preordered, so we've more than doubled our first goal! Amazing! That brings us to our first unlocked goal: The Prime Wardens! 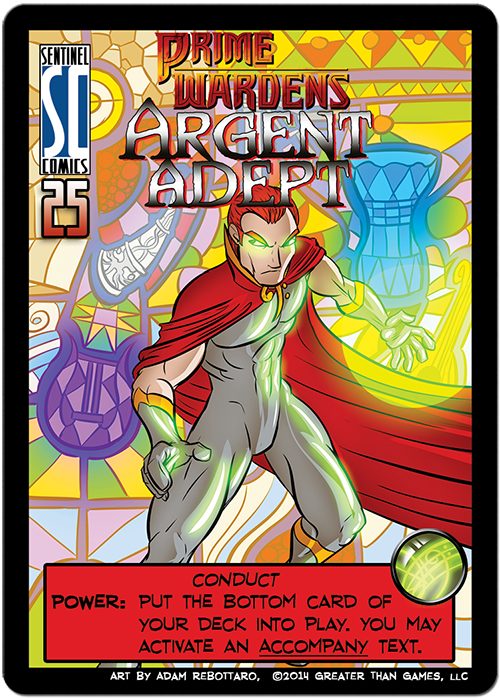 A team that was formed to aid a neophyte Virtuoso of the Void against Akash'Bhuta, the Prime Wardens were led by The Argent Adept in that conflict. Read more about Over 100 Copies Preordered! Promo Cards Unlocked! Welcome to the Wrath of the Cosmos Preorder! Welcome to the first update of the Wrath of the Cosmos preorder campaign! What is Wrath of the Cosmos? I'm glad you asked! 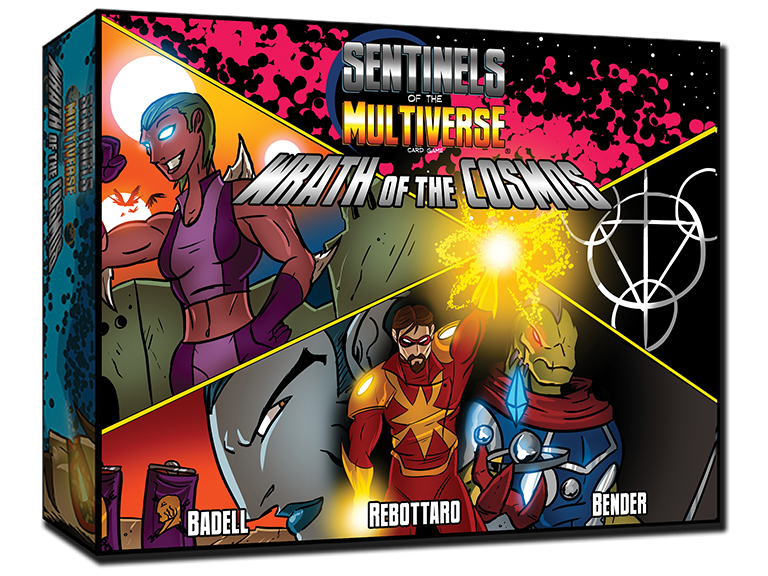 It's the upcoming expansion for Sentinels of the Multiverse, the cooperative comic book card game! Read more about Welcome to the Wrath of the Cosmos Preorder!